Congratulations to James Giddings and his co-driver, Sion Cunniff, on taking the trophy in the latest stage of the 2018 MRF Tyres ST Trophy. The event saw the running of the Rallynuts stages, with 7 registered crews entered to fight for top honours. It was held in Builth Wells, making it the “home event” for Swansea driver, James. 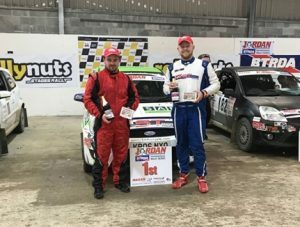 After their win on the recent Rallynuts Stages, James and Sion now lay in first place in the 2018 MRF Tyres ST Trophy as well as in the Group N3 production class. 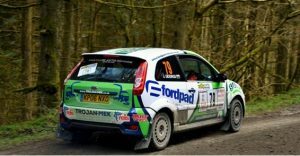 Trojan-Mek are proud to be long-standing sponsors of James and his rally car, and wish him and Sion great success throughout the remainder of the competition. 5 rounds remain in the 2018 MRF Tyres ST Trophy, with the next round The Plains Rally on the 12th of May. The rally is based in Welshpool and uses some of the same iconic stages as the world championship round of the Wales Rally GB. ← Trojan-Mek Machinery Movers call for more clarity in logistics ahead of Brexit.